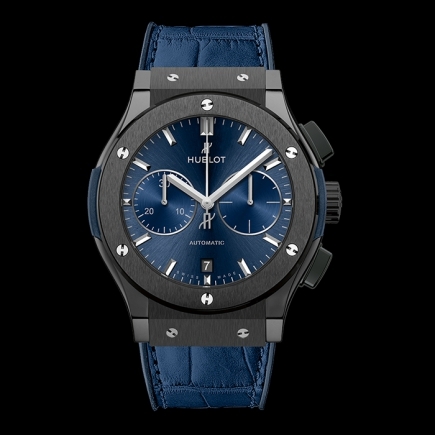 hublot | 32'100 € Tax inc.
With harmony and proportion, Hublot and Sang Bleu create an original intriguing and eye-catching piece. Its construction is reminiscent of the symbolism in the geometric shapes so dear to Sang Bleu. 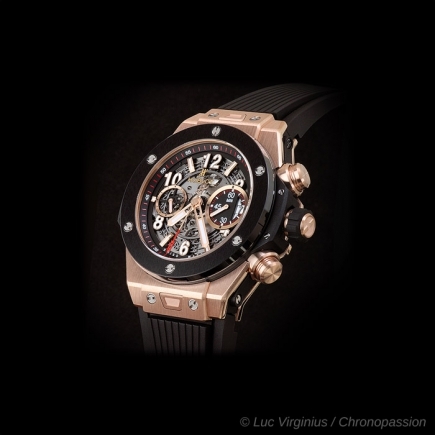 It evokes the harmonious and proportional relationships derived from Leonard de Vinci’s Vitruvian Man. Symmetric effects that have guided Humanity since the dawn of time and that have created the greatest architectural projects in the world. Shapes that characterize Maxime Büchi’s tattoo designs and echo the quest for perfection and the worship of symbols that bring his work to life. 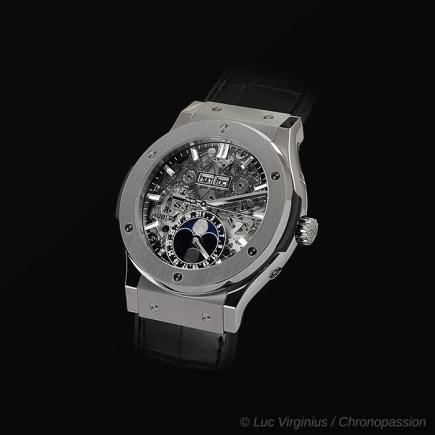 Celebrated during Fashion Week in London in February, the collaboration between Hublot and Sang Bleu takes the form of a glass and metal sculpture. 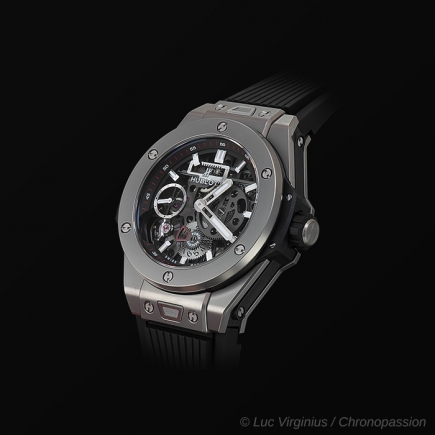 A work made of singular shapes spatially transposing the visual codes that create the watch’s architecture. A unique motif, drawn out by the subtle play and superposition of rings and squares, not only evokes the quadrature of the circle but also tells the time in an audacious manner. Aesthetics that imprint a new graphic identity upon our iconic Big Bang. 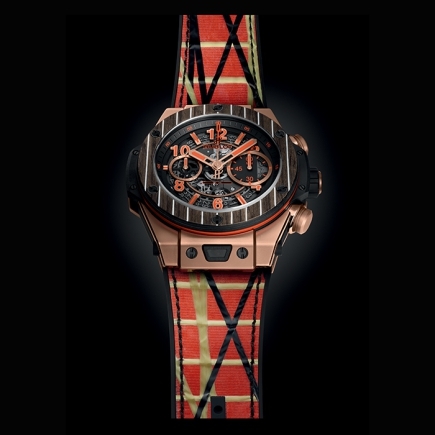 A brand-new, totally redesigned Big Bang, which sees its lines beveled, cut by the geometric effect. 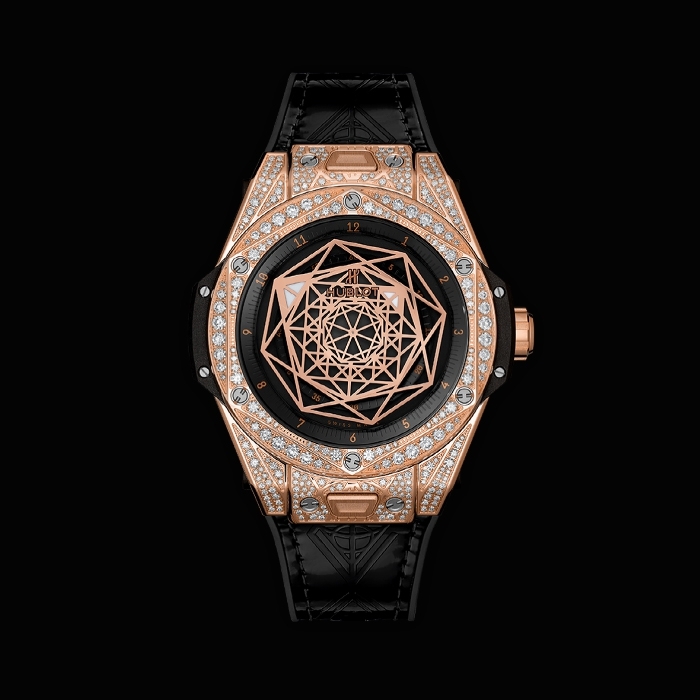 The bezel of the Big Bang sees its roundness shaped into a hexagon. These facets confer a three-dimensional effect upon it. 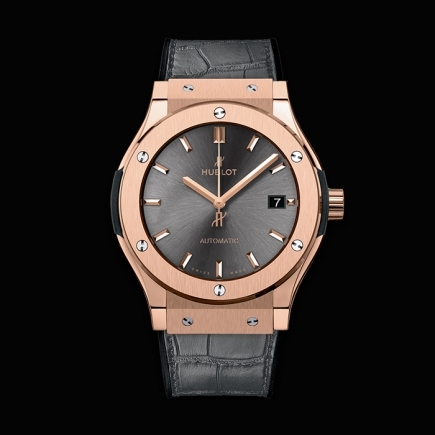 The matt black dial presents a wide black satin- finish circular flange stamped with the hours. The numerals created for this piece by Maxime's typeface-design agency SwissTypefaces SARL. As for the seconds counter, it appears discreetly on the metal sculpture that dresses the dial. Curves that contrast with the piece as a whole. 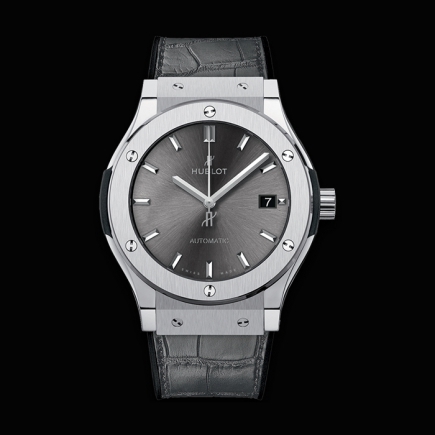 As if to reinforce its mysterious spirit and give time another dimension, no hand appears on the dial. 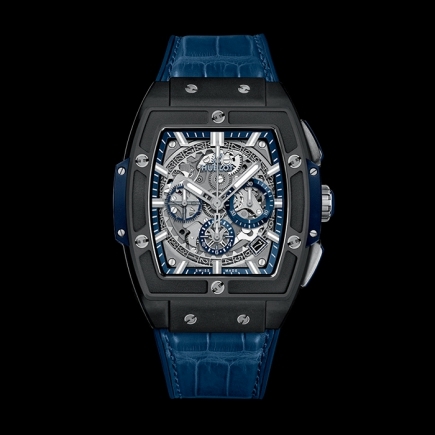 The time is displayed through the superposition of three rhodium- plated octagonal-shaped discs. The largest disc indicates the hours, while the small one marks the minutes. To make it easier to tell the time, one of the tips of the hours and minutes octagons is in white Superluminova. 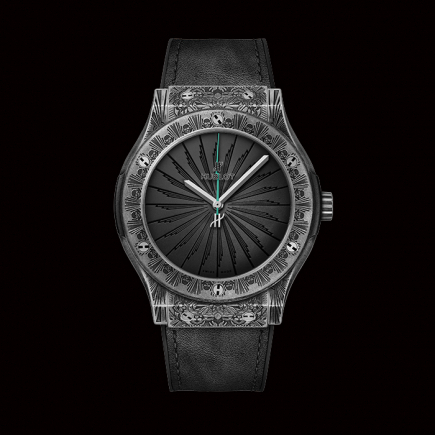 As for the seconds, these tick by in the center on a black disc stamped with the H of Hublot and the stylised hourglass of Sang Bleu. 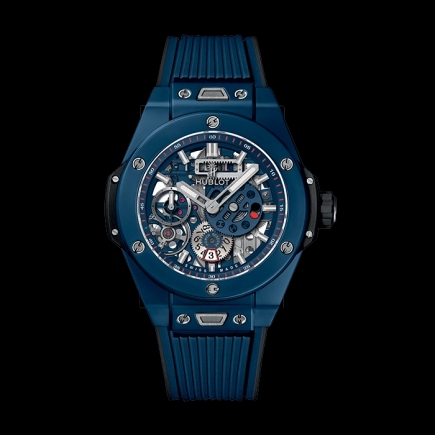 Available in a run of 200 pieces, the titanium Big Bang Sang Bleu follows the rhythm of the Unico manufacture movement, which has been entirely remodeled without a chronograph and redesigned in order to tell the time through three discs. 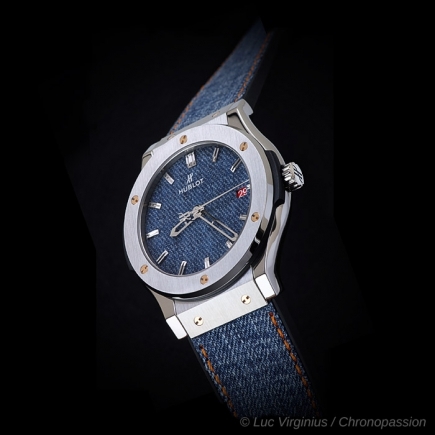 As for the oscillating weight, its silhouette features the triangular codes of the Sang Bleu logo. 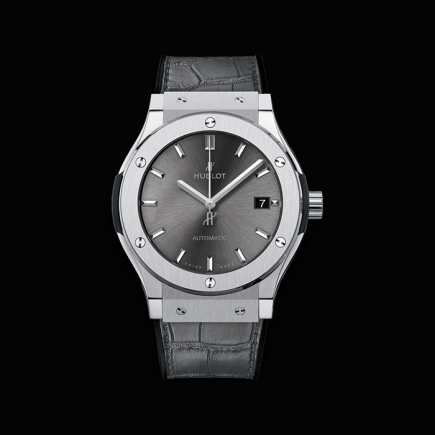 WHEN TWO ART FORMS COME TOGETHER: THE FUSION OF HAUTE HORLOGERIE AND HAUTE JOAILLERIE. Just like watchmaking, the art of stone setting is an ancestral one, where the methods of meticulous handwork has been preserved and passed down through the centuries. 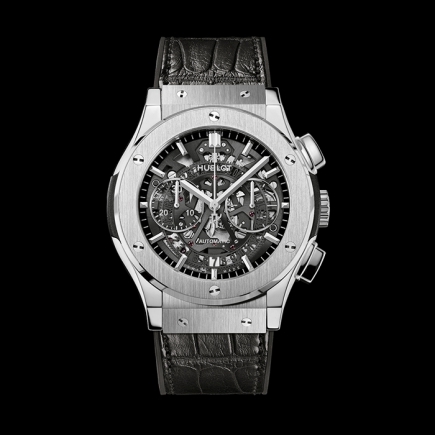 With a respect for tradition and passion for innovation, Hublot practices traditional stone setting techniques as well as advanced technology to embellish timepieces in the most original ways. 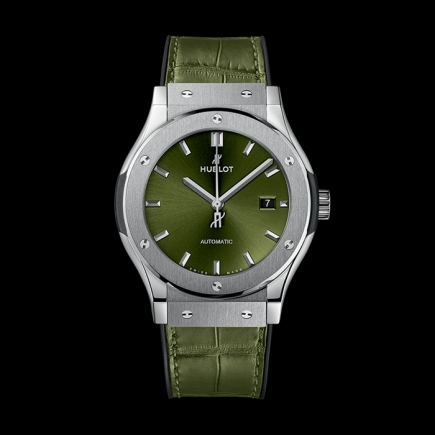 And while diamonds have been and remain the most coveted gemstones for their rarity and prismatic scintillation, Hublot regards the world of gemology full of possibilities, incorporating precious stones such as emeralds, rubies and sapphires as well as semi-precious stones such as amethyst, topaz and hematite and countless others that transform a watch into so much more than just a timepiece. Depending on the shape or “cut” of the stones as well as the desired aesthetics, different setting methods are used. 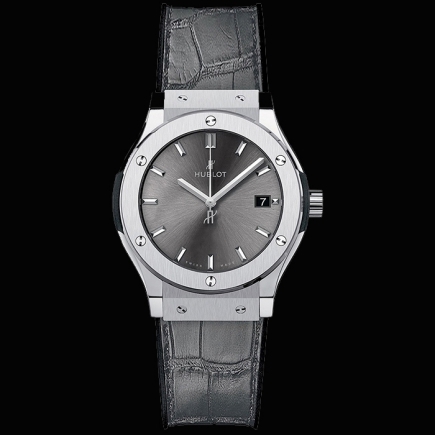 For brilliant cur round diamonds and stones, Hublot uses the method of “grain” setting, where four small metal claws on four points of the gemstone. Baguette-cut stones on the other hand are usually set in a “channel”. 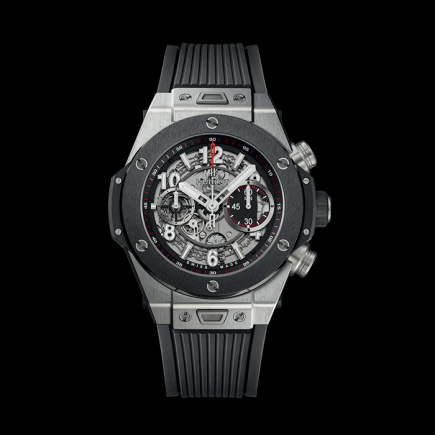 Besides the meticulous handwork that goes into creating each and every diamond-embellished component, Hublot goes to great extents in procuring gems from all over the world that are of a uniformly high quality. Diamonds for example are all Top Wesselton grade. 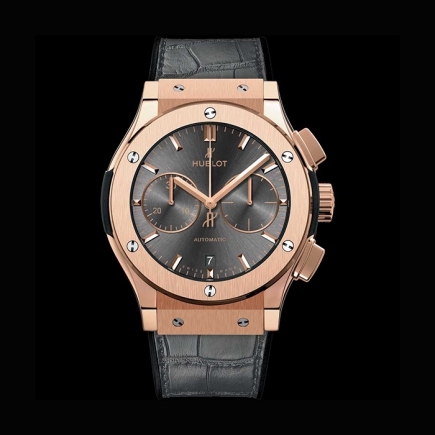 The most outstanding of all Hublot Haute Joaillerie creations and to a lager extent jeweled watches in general are the $Million Big Bang unique pieces. Using a specialized state-of-the-art microsurgery machine, of which only two exist in Switzerland, the stones are set without any visible claws, prongs channels. 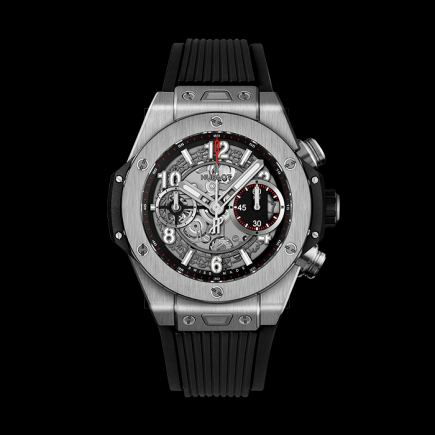 This “invisible setting” for just one timepiece takes several months to complete, where the slightest manipulation error results in the gem-setter having to start the entire all over again. 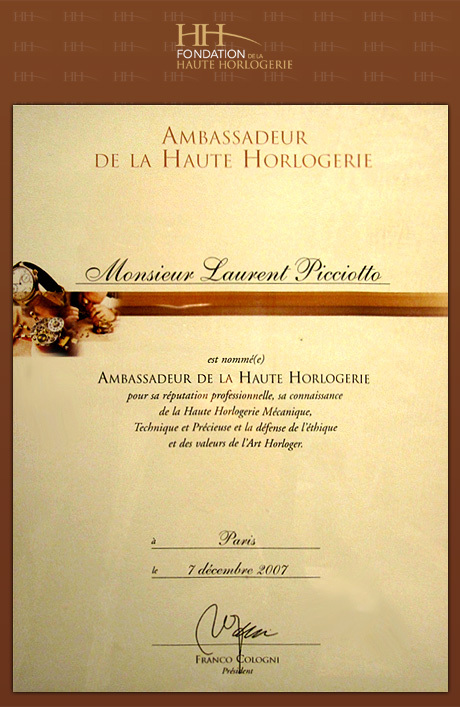 In certain pieces such as the Classic Fusion Haute Joaillerie One Million, Hublot even goes as far as to set baguette cut diamonds into the bridges of the skeleton tourbillon movement. 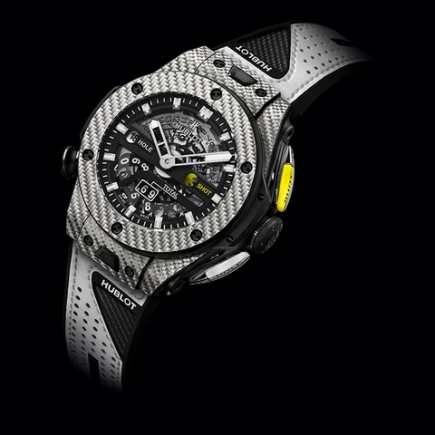 Going beyond the boundaries of traditional precious metals, Hublot has even developed proprietary innovations in the centuries-old craft of stone setting by incorporating traditional setting techniques into 21st century materials such as carbon fiber.